GEORGE dropped in unexpectedly for dinner the other night. Not that anyone complained. As the guests tucked in to their wonderful meals his 3m, 300kg-plus frame suddenly appeared. Perhaps suddenly is the wrong word, as George drifted up lazily towards the window and turned his head to glance nonchalantly inside at the humans gaping out at him. My fellow diners and I stopped our dinner mid-bite, almost spilling our pinot noir as we leaned forward to peer in awe at Reefworld's largest resident. He swam slowly by the windows of the viewing chamber and disappeared. He then reappeared and swam to and fro for the rest of the meal. 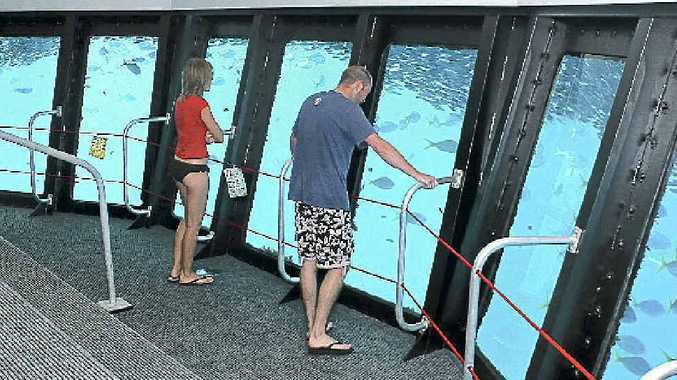 George has been resident under the pontoon on the Great Barrier Reef for 30 years and almost on cue the giant Queensland grouper loomed up from the depths and joined the giant trevally and other fish attracted by the light outside of the viewing chamber. Visiting the Great Barrier Reef, was on my to-do list. And with Reefsleep I hit the jackpot. Not only did I visit one of the seven wonders of the natural world but I got to spend the night on a pontoon on Harvey Reef in the Great Barrier Reef Marine Park. To clarify, the Reefworld pontoon (actually two pontoons) is the largest pontoon facility in Australia measuring a total length of 86m. Snorkelling, diving, semi-submersible coral and fish viewing, and an underwater observatory are just some of the attractions to enjoy on Reefworld. Getting into the spirit of the visit I put my hand up to do an introductory scuba dive. I would recommend it to anyone, even if it does mean you have to wear a bright pink stinger suit to protect against jellyfish. The highlight was floating under the pontoon, watching in awe as huge Queensland groupers hung in the current, at the time I thought they were big but I hadn't yet seen George. Once the day visitors have left, the exclusive few who stay behind for the Reefsleep experience are spoilt. Not only do you get to the solitude and tranquillity of the reef, you also are pampered by the great staff. In the late afternoon we went for a guided snorkel with a marine biologist, we got dropped out in the lagoon and slowly made our way back along the reef edge to the pontoon. No sooner had we dried off and changed from that experience then it was on to the semi-submersible for a trip along the reef face to view the coral and fish below. As we stared in wonder at the marine life just below our feet we sipped champagne and nibbled on canapés - now that's how to view a reef! As the sun set on this perfect day we lazed with a drink on the deck of the pontoon, completely relaxed and at peace. According to the brochure the accommodation offered on Reefsleep is limited to two choices of room - one bunk style quad (four-share) or one with a king size bed - ideal for honeymooners or that special occasion. I discovered there was a third option, a swag out on the deck under the stars. I choose this third option and had one of the best sleeps ever (although presumably the pinot helped). Waking up to gaze out over the Great Barrier Reef is a chance not many people get. On the second day there I was lucky enough to get a helicopter flight with Hamilton Island Air over the reef to the famous Heart Reef. The trip from Shute Harbour to Reefworld and back on Fantasea's high-speed catamaran takes you through the sheltered waters of the beautiful Whitsunday islands.